Mangalore, Nov 22, 008: Young B.H.Tanvi Rao of Mangalore has hit a double in just nine days. On November 14 the Children�s day she was honoured by Governor of Karnataka Rameshwar Thakur at Bangalore for her contribution to the culture. It is needless to say she is a child prodigy in Bharatnatyam as every Mangalorean who has some interest in culture and art knows her by name. 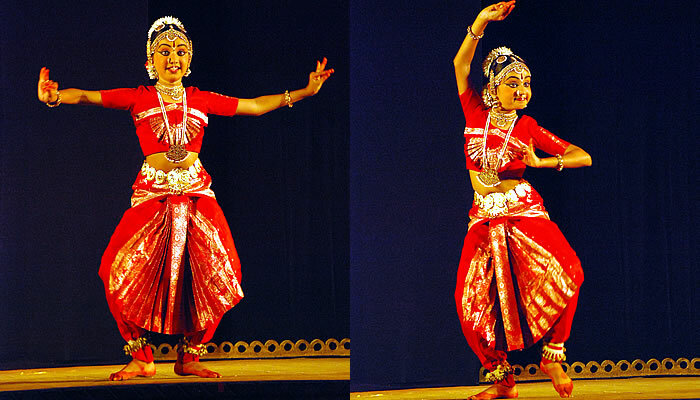 On 22 November she entered the arena of senior and more serious Bharatnatyam exponents. Her Rangapravesham (also is called Arangetram in Tamil) was solemnized on Saturday at Town Hall. Filled to the brim the Town hall reverberated to the talent of Tanvi Rao right from the �Thillana� An Arangetram is the first formal presentation of a student to the audience by her teacher. This takes place after the student has completed the basic training. It is only a small stepping stone in the study of this art form. After this is accomplished the student continues to pursue her study of dance. On the day of the Arangetram the student offers her knowledge of this art form at the feet of here Guru, and to Lord Shiva Nataraja. On this auspicious occasion the artist ascends the stage with hopes to display her talent while growing closer to god. Young Tanvi who is in her 6th standard performed all the requisites of an Arangetram with a flourish. Her Mangalam which is offering prayers to the god and to her Gurus was a touching moment. Chief guest on this occasion Vinay Hegde, president, Nitte education Trust, who watched the performance of Tanvi said she had learnt well and was an extra-ordinary talent in the dance form and could grow into a fine exponent of Bharatanatyam in years to come. Well known dance teacher Ullal Mohan Kumar of Natyanikethana, Kotekar earlier inaugurated the Arangetram, Others who were present included writer and literary critic N. Damodar Shetty, senior artist and writer, Dr Na D�Souza, writer and national award winner, and Mr.Aerya Laxminarayana Alva well known folk expert. Special guests had also arrived from Bombay�s tinsel world they were Rakeshnath, and Reema Rakeshnath, who showered praises on Tanvi. On this occasion a brief �Guruvandana� ceremony was held where Tanvi felicitated her teachers, well known dance teacher siblings Geetha Saralaya and Rashmi Saralaya, and her Carnatic music teacher K V Raman. Proud parents of Tanvi Hariprasad Rao and Swarna Gowri Rao, felicitated the guests. In another brief function on this occasion a book written by B N G K Rao grand father of Tanvi entitled �Nallege�(An anthology of Kannada Poems). The two hour performance can be described as scintillating. Especially when the accomplished accompanists like K V Raman (vocals), M Hanumantharaju Mysore (mridangam), Manju Mysore (violin), Tanvi�s teachers Vidushi Geetha Saralaya and Vidushi Rashmi Saralaya acted as Nattuvangam fused their talents to make Tanvi�s Arangetram a memorable event. According to a hand out given on this occasion in the form of a colourful portfolio of Tanvi-She started Bharatanatyam at the age of four and a half. After one year she won state and national-level dance competitions. She was also among the top four contestants in �Prachanda Putani�, a talent show organized by Zee Kannada in October 2007. Indeed a natural talent is blossoming in costal Karnataka. In the days of filmy dance getting popular, inclination towards our traditional dance form should be encouraged.